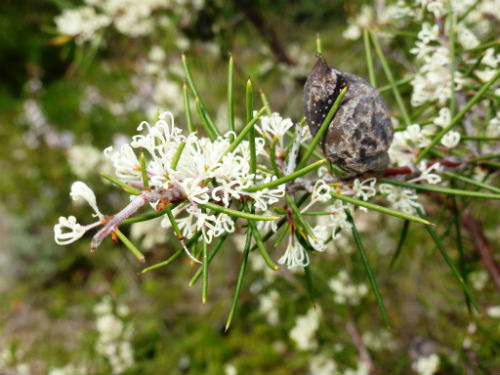 Hakea sericea, Silky Hakea or Needlebush is a tall shrub reaching a height of seven metres. Juvenile growth is light green with silky hairs hence the former common name. There is nothing silky about the adult foliage. Leaves are stiff, linear, narrow, dark green and crowned with an extremely sharp point (hence the latter common name). Flowers are white, profuse and usually perfumed. Flowering extends from July to November. Blooms are followed by large, persistent, woody fruits. Each fruit contains the usual two winged seeds. Harvesting the fruits is a painful process due to the prickly foliage. On the plus side the foliage provides safe shelter and nesting sites for small native birds. Double-barred finches frequently nest in our Silky Hakeas. H. sericea is found from southeast Queensland to southeast NSW. The Silky Hakea has become a serious environmental weed in South Africa. It was introduced as a hedging plant in about 1858. A clump of three or more Silky Hakeas would be a useful addition to bird-friendly gardens. H. sericea was cultivated in England in the early 1800’s. The species name refers to the silky hairs.